Sometimes, we just need to let our customers speak for us! And here are some glowing reviews to prove it! 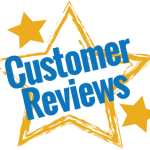 We appreciate all the feedback received from our customers and would love to hear about your experience with our company. Send us your reviews, questions and comments on our products and services. And let us know if there is anywhere we need to improve.